This is an essay prompt that can be used as a writing practice assignment, a sponge activity, a benchmark writing test, a homework activity, a timed writing, a journal writing activity, or an enrichment activity. The assignment sheet was created by Terri Wilson, a teacher who teaches the writing process and the six traits of effective writing to her students. 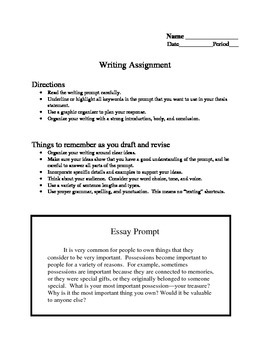 The writing assignment sheet includes clear directions, a well-stated prompt, and writing tips. The prompt asks students to consider things that they treasure. This is a relevant topic for students in grades 6,7,8,9,10,11,12 and adult school.